Settlement deeper and deeper into the interior of the vast North American wilderness increased drastically by the mid 1700’s. The Spanish were pushing northward, up the Mississippi Valley, the French were coming south and west through the Great Lakes area and the British moved west from the Atlantic coast. Ever increasing demand for cleared land, meat and furs all exerted pressure on the diminishing supply of animals in what became known as the “Middle Ground” and “The Ohio Country“. Legitimate efforts by some, especially the Quakers, to legally purchase huge areas of land from the Indians proved ineffective in the overall expansion. 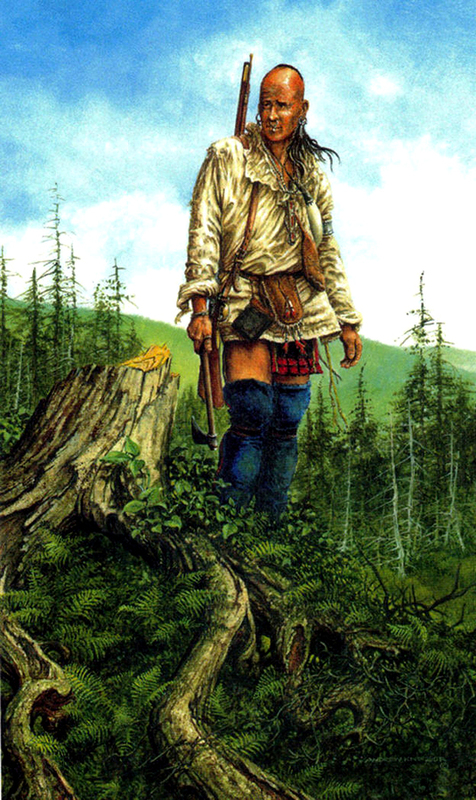 Cherokees sold land that traditionally belonged to the Iroquois Confederation and at the Treaty of Fort Stanwix in 1768, the Iroquois Confederation sold to the British, all the land west of the Allegheny Mountains to the Ohio River and as far southwest as the Tennessee River. Serious problems arose immediately because that land was actually claimed by other Indian nations, mainly the Shawnee and Delaware. Laws passed by Pennsylvania and Virginia against white settlement beyond the borders of treaty purchased land were widely ignored by frontier families looking for that plentiful paradise, free from oppressive government control. This painting depicts a moment in time when a Delaware hunter returns to a valley west of the Allegheny Mountains where game had been plentiful in the past. As he emerges from a hemlock forest and climbs to the top of a low rise he gazes past the freshly cut trees into the valley below. The settlers have arrived and he knows that the “End of an Era” has arrived.